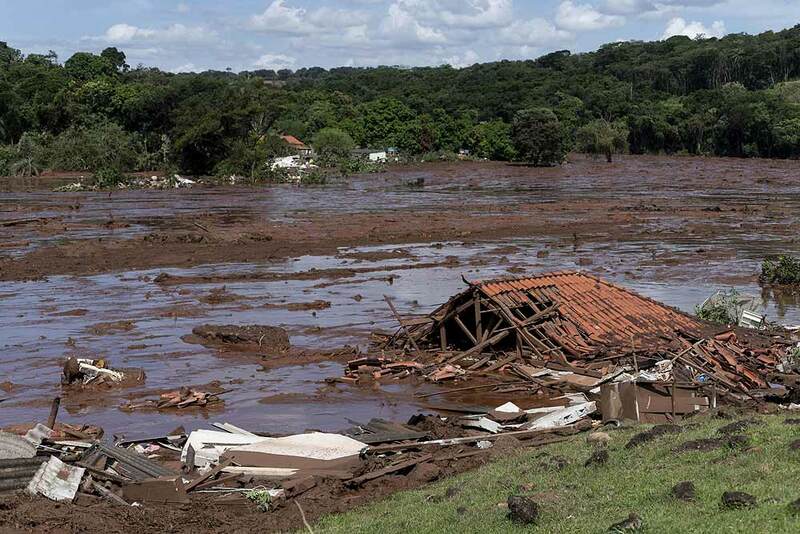 Seven Bodies Found and at least 200 people were to be missing after a dam burst at a Brazilian iron mine and caused severe flooding in the southeastern state of Minas Gerais. 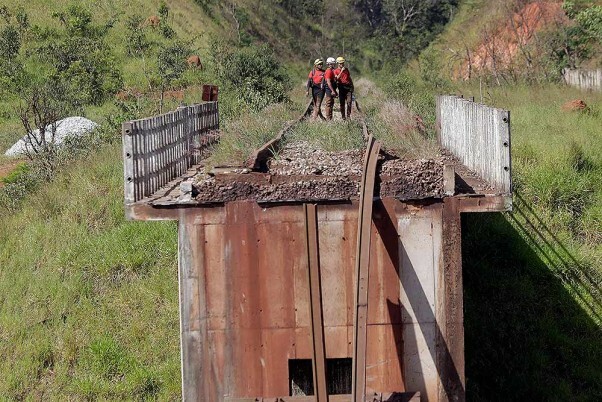 Rescue workers walk on a rail bridge that was destroyed after a dam collapse in Brumadinho, Brazil. 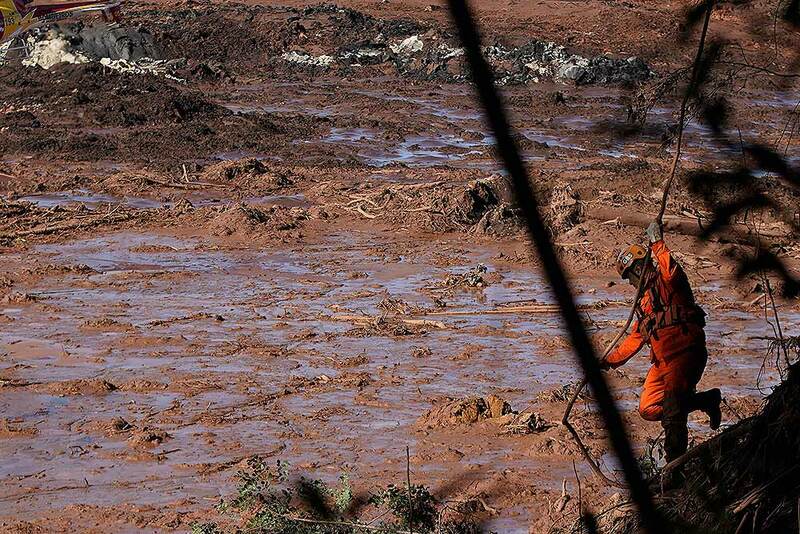 Firefighters carefully moved over treacherous mud, sometimes walking, sometimes crawling, in search of survivors or bodies, four days after a dam collapse that buried mine buildings and surrounding neighborhoods with iron ore waste. 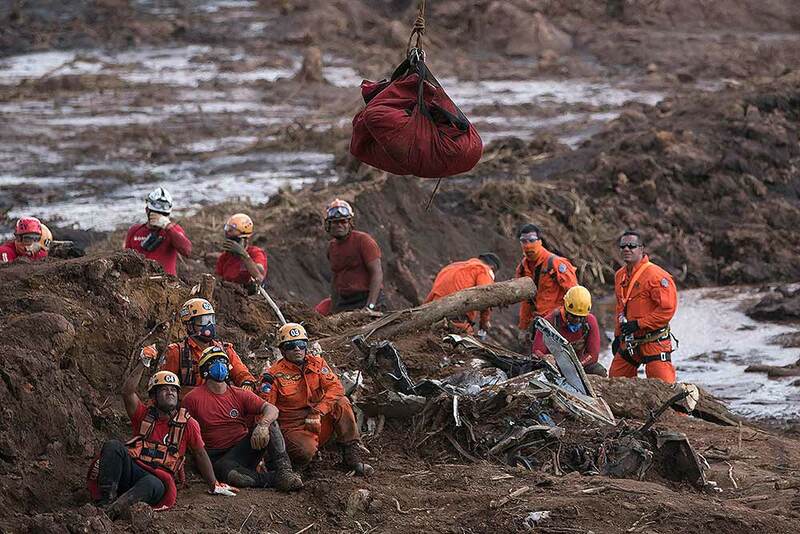 Rescue workers in a helicopter search a flooded area after a dam collapsed in Brumadinho, Brazil. 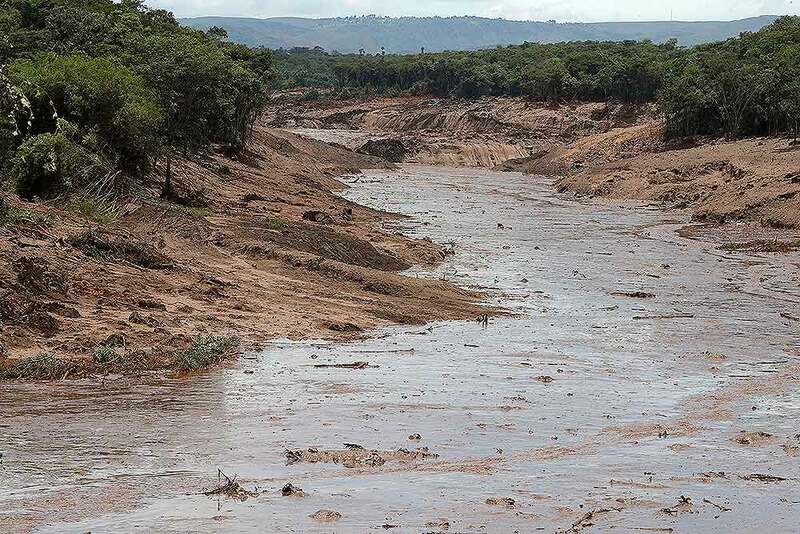 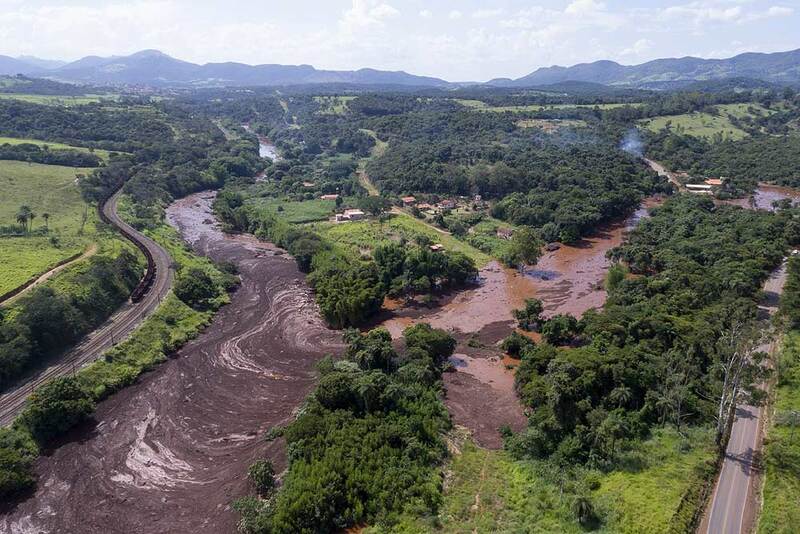 A massive, deadly river of pale brown mud released by the collapse of a mining company dam on Friday threatens to cause an environmental disaster for Brazil, potentially snatching away livelihoods and driving the spread of disease, activists warned. 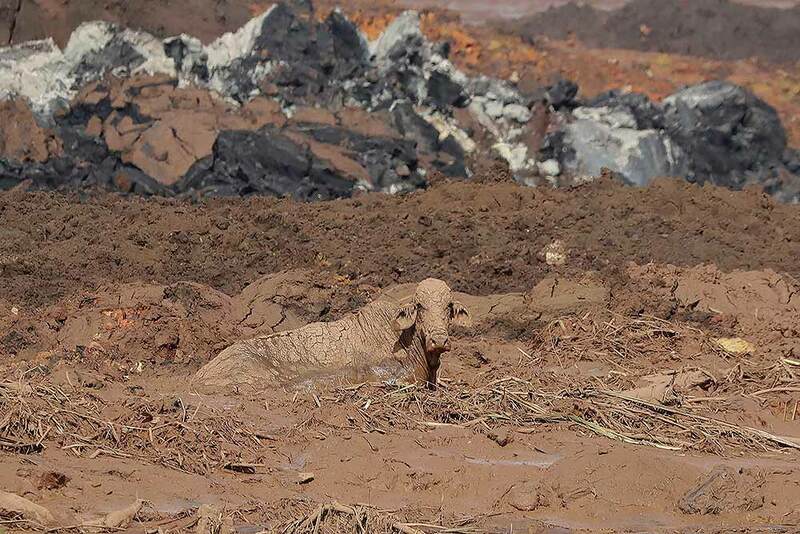 A cow sits stuck after a dam collapsed in Brumadinho, Brazil. 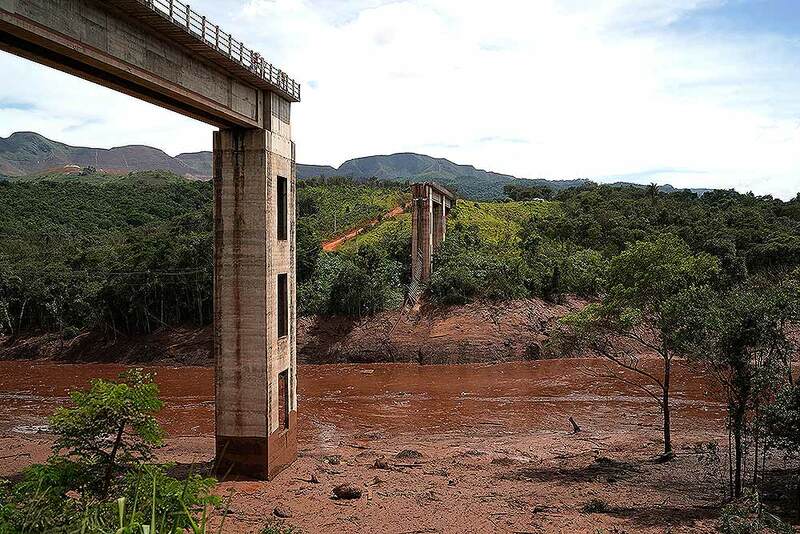 Brazilian officials suspended the search for potential survivors of a Jan. 25 dam collapse that has killed at least 40 people amid fears that another nearby dam owned by the same company was also at risk of breaching. 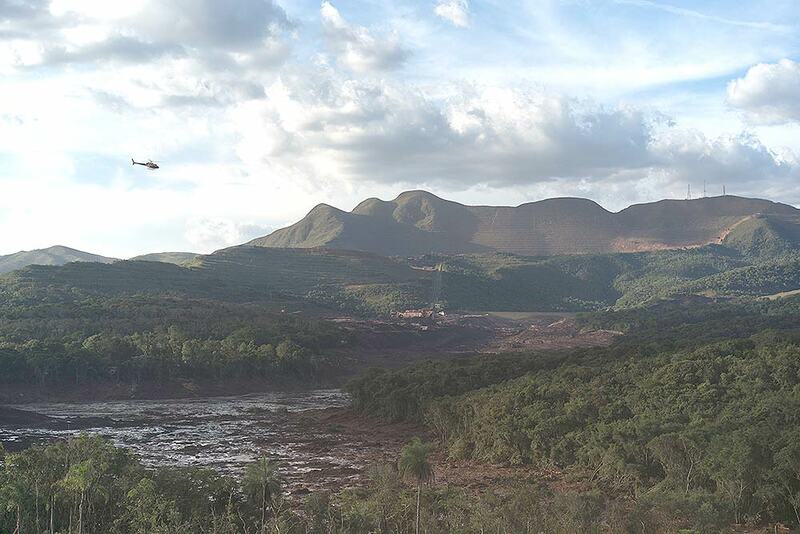 Members of the rescue operation fly over the site where a dam collapsed two days ago, next to dam B6 that also had an collapse alert, in Brumadinho, Brazil. 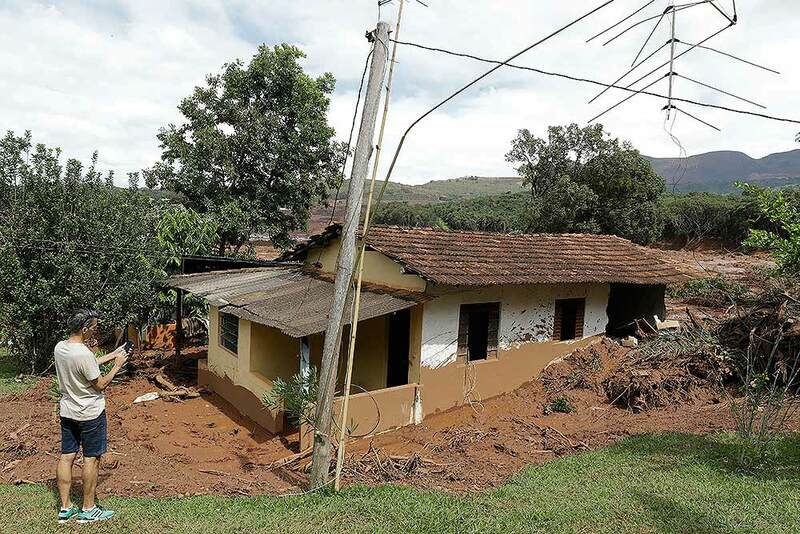 Authorities evacuated several neighborhoods in the southeastern city of Brumadinho that were within range of the B6 dam owned by the Brazilian mining company Vale. 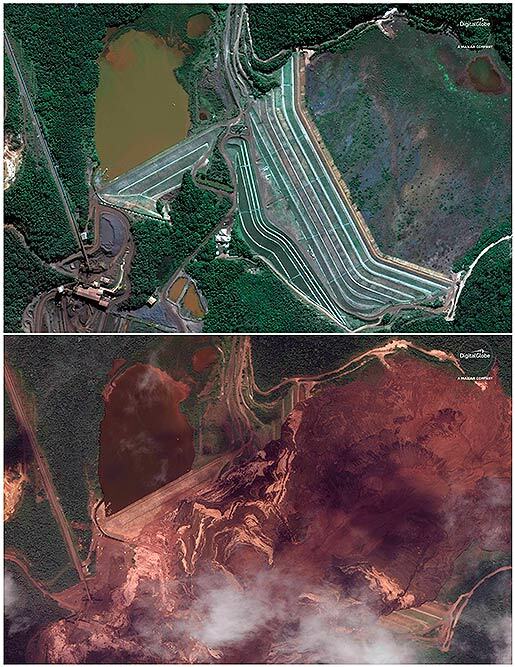 This combo of satellite images provided by DigitalGlobe shows an area northeast of Brumadinho, Brazil on June 2, 2018, top, months before a dam collapsed and covered the area, below, seen on Saturday, Jan. 26, 2019. 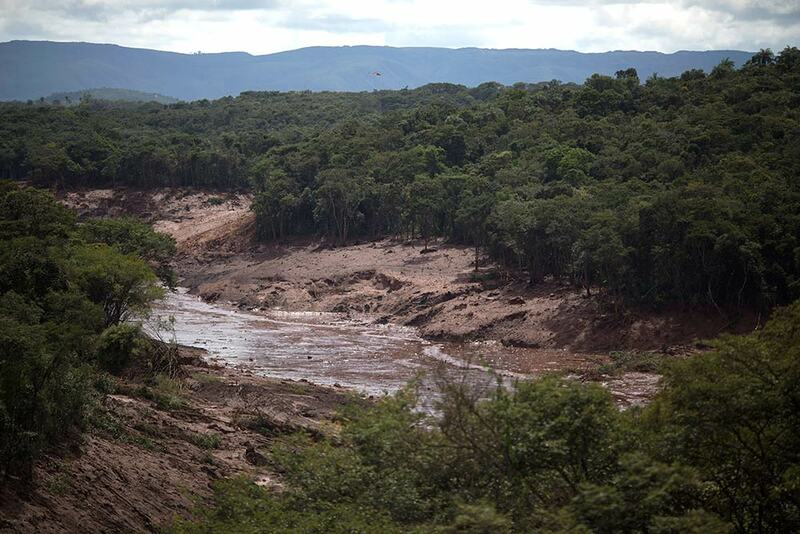 Brazilian officials suspended the search for potential survivors of the Jan. 25 dam collapse that has killed at least 40 people amid fears that another nearby dam owned by the same company, Vale, was also at risk of breaching. 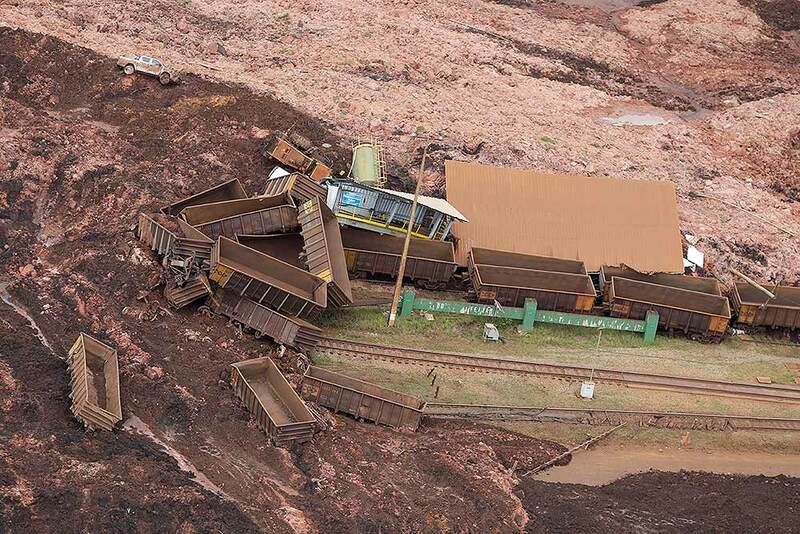 An aerial view shows destroyed vehicles and wagons after a dam collapsed in Brumadinho, Brazil. 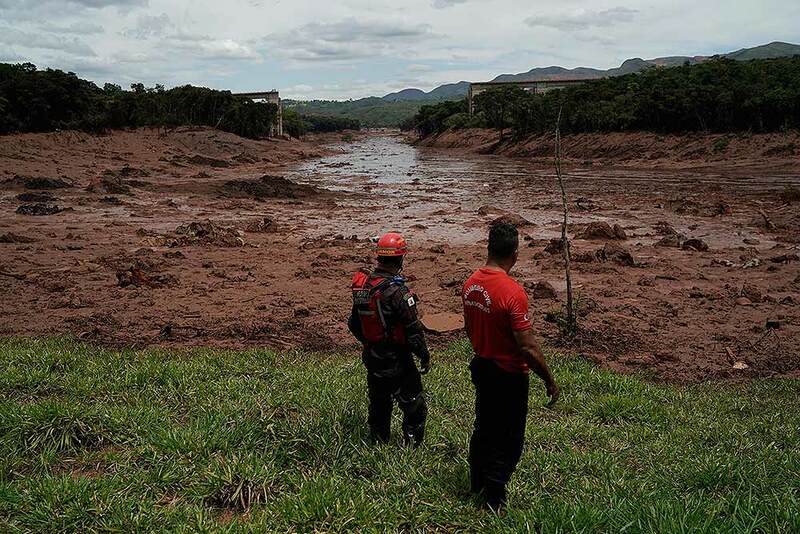 Rescuers searched for survivors in a huge area in southeastern Brazil buried by mud from the collapse of dam holding back mine waste, with several people dead and hundreds missing. 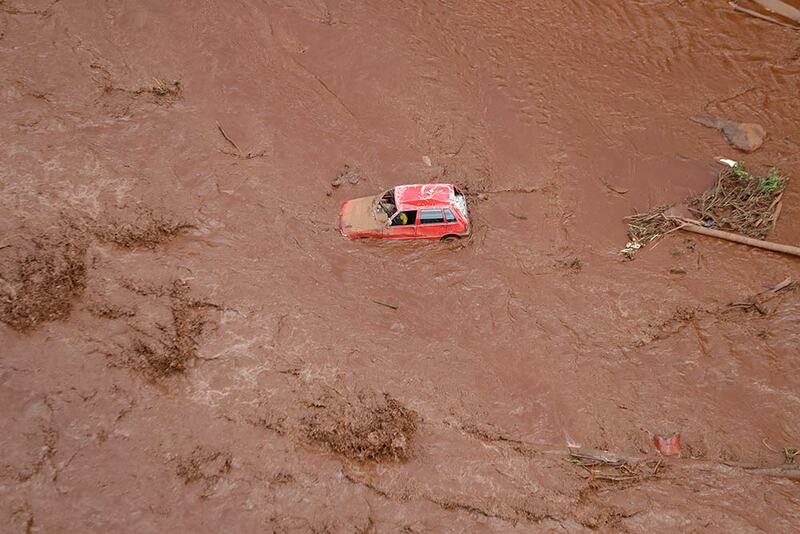 An aerial view shows a destroyed vehicle after a dam collapsed in Brumadinho, Brazil. 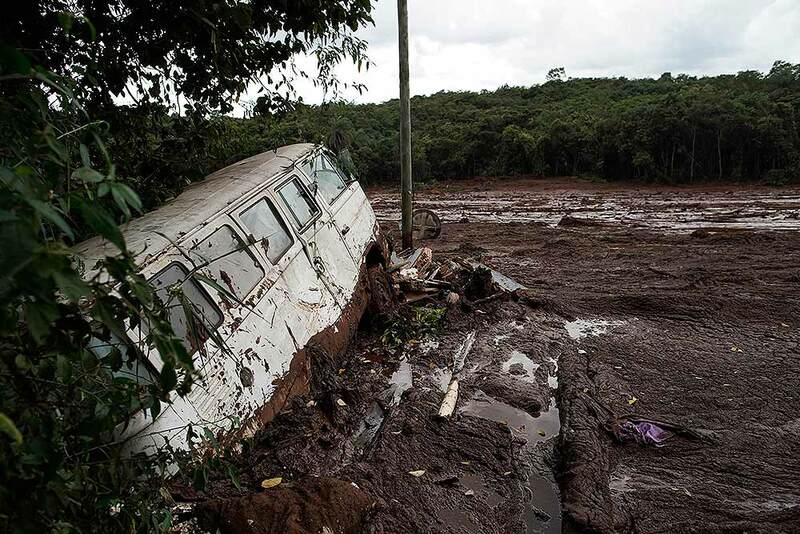 A van is seen in half buried in the mud after a dam collapse near Brumadinho, Brazil. 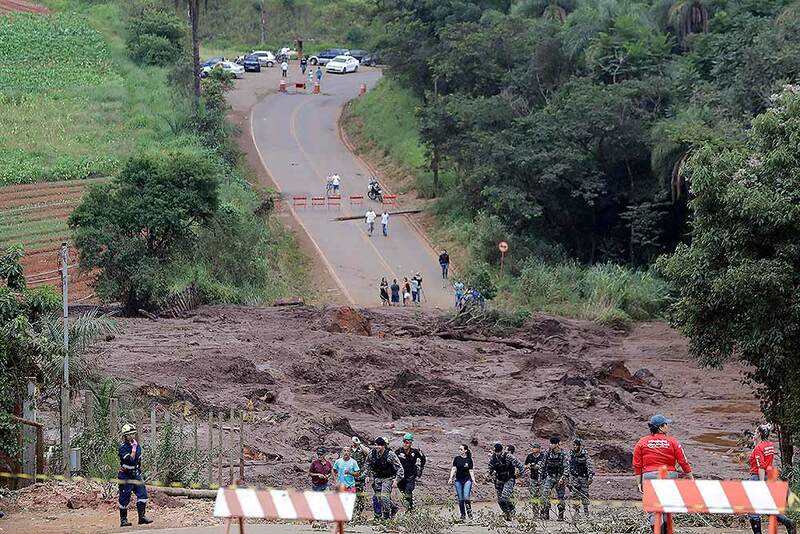 Rescuers in helicopters searched for survivors while firefighters dug through mud in a huge area in southeastern Brazil buried by the collapse of a dam holding back mine waste, with at least nine people dead and up to 300 missing. 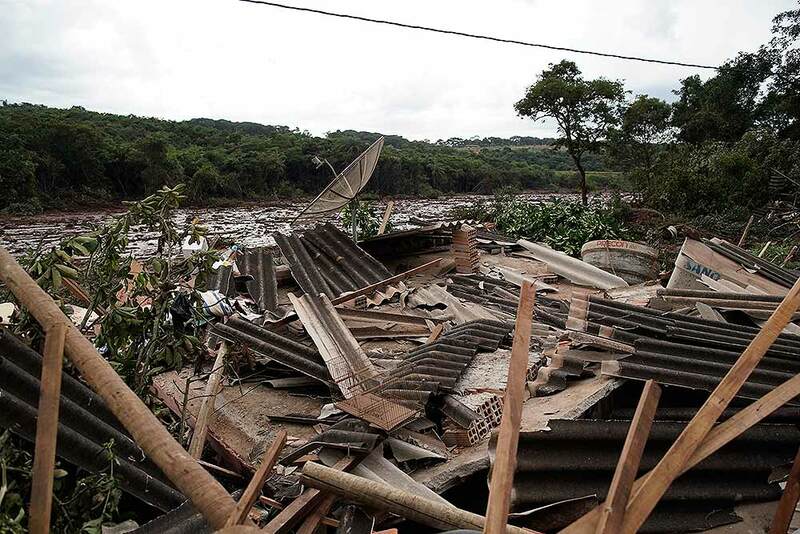 A destroyed house is seen after a dam collapse near Brumadinho, Brazil. 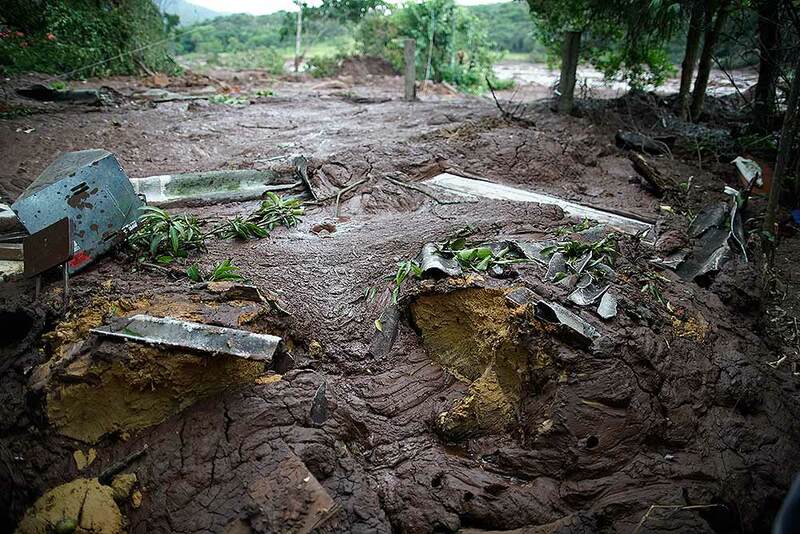 The mud covers the backyard of a house after a dam collapse near Brumadinho, Brazil. 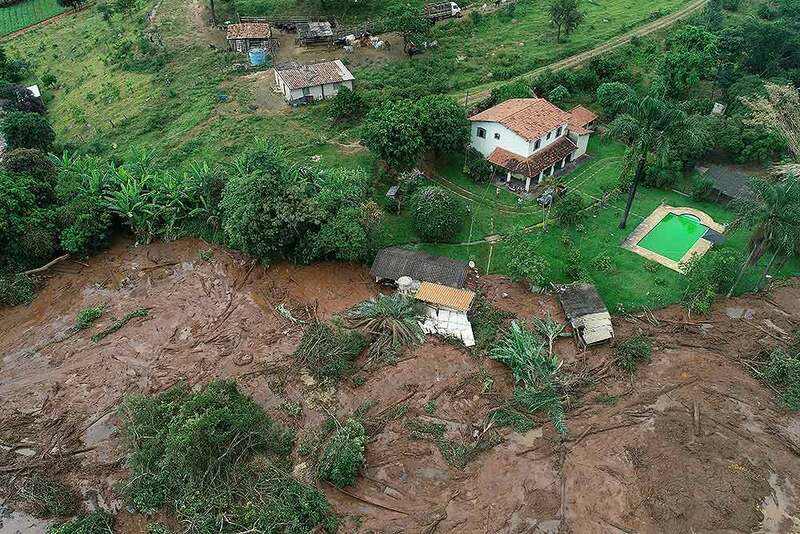 An aerial view shows a partially destroyed house after a dam collapsed, in Brumadinho, Brazil. 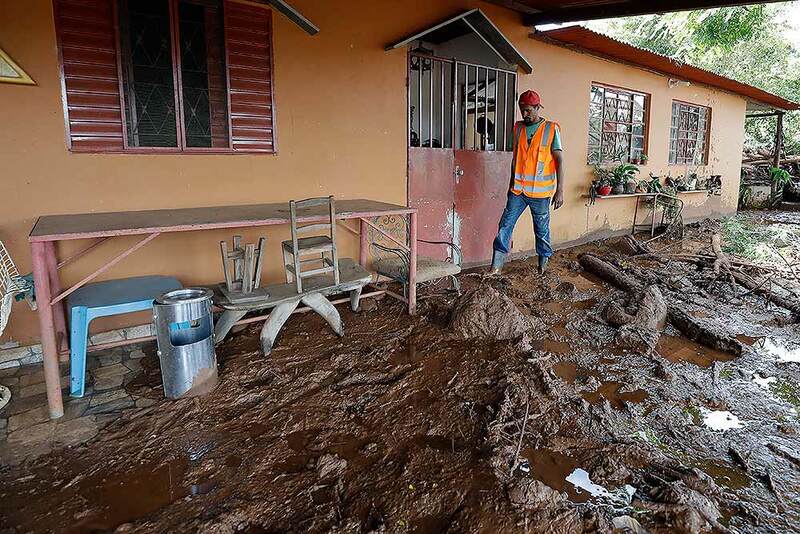 An estimated 300 people were still missing and authorities expected the death toll to rise during a search made more challenging by intermittent rains. 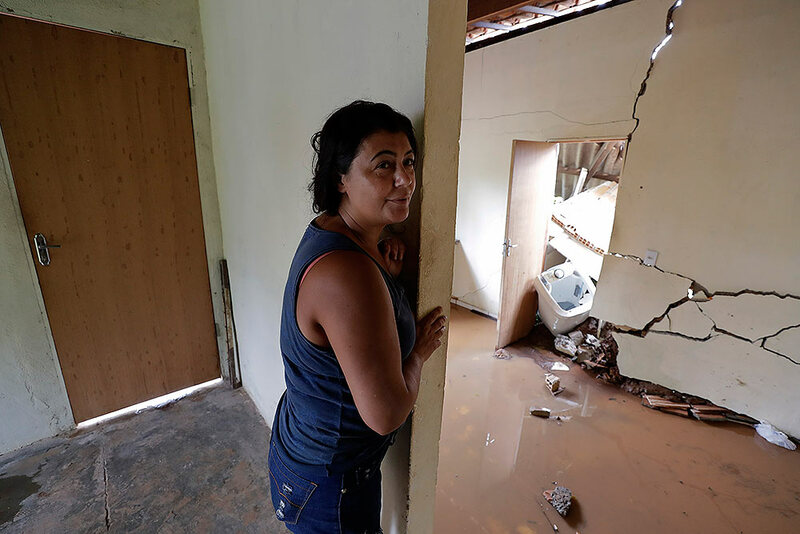 Isamara de Araujo stands inside her partially destroyed house after a dam collapsed in Brumadinho, Brazil. 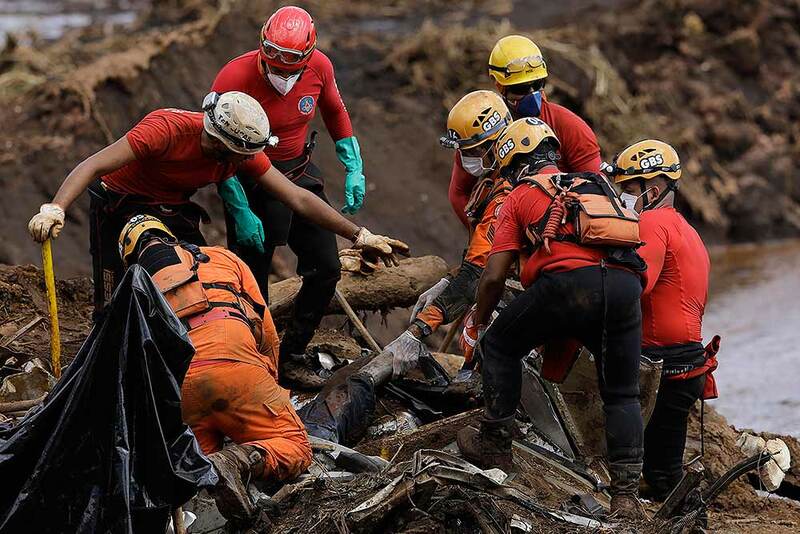 An estimated 300 people were still missing and authorities expected the death toll to rise during a search made more challenging by intermittent rains. 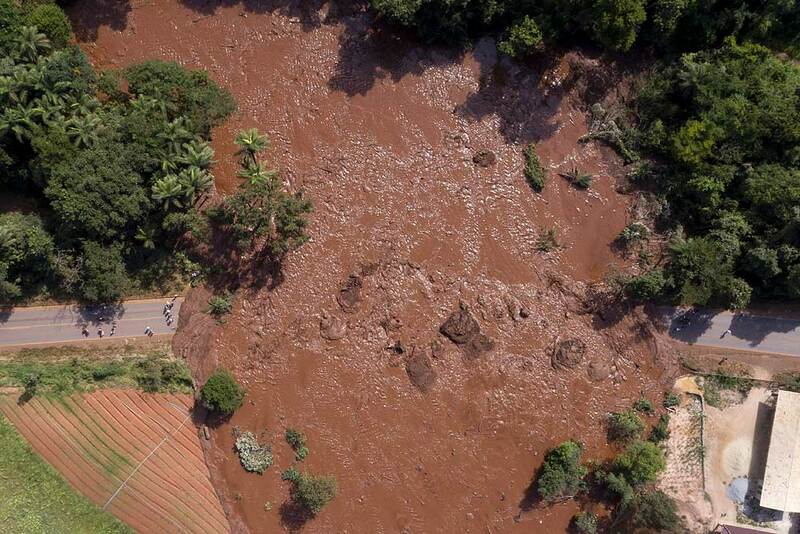 An aerial view shows a collapsed bridge caused by flooding triggered by a dam collapse near Brumadinho, Brazil. 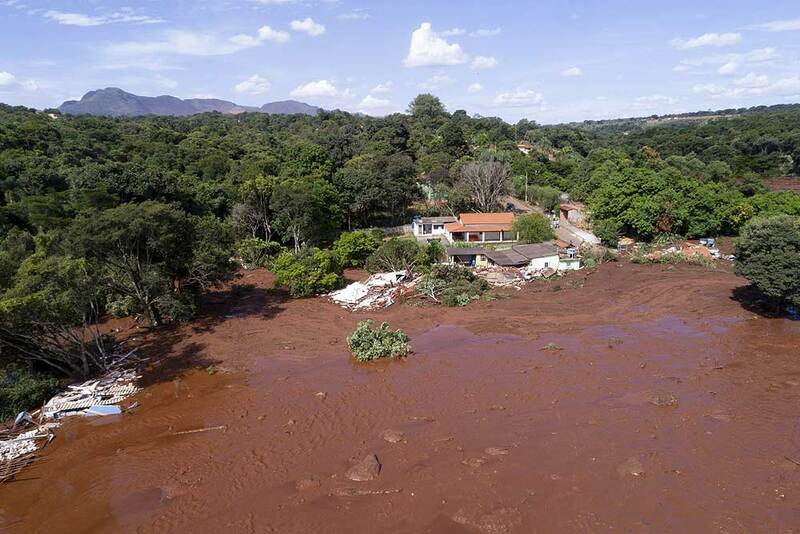 The dam that held back mining waste collapsed, inundating a nearby community in reddish-brown sludge, killing at least seven people and leaving scores of others missing. 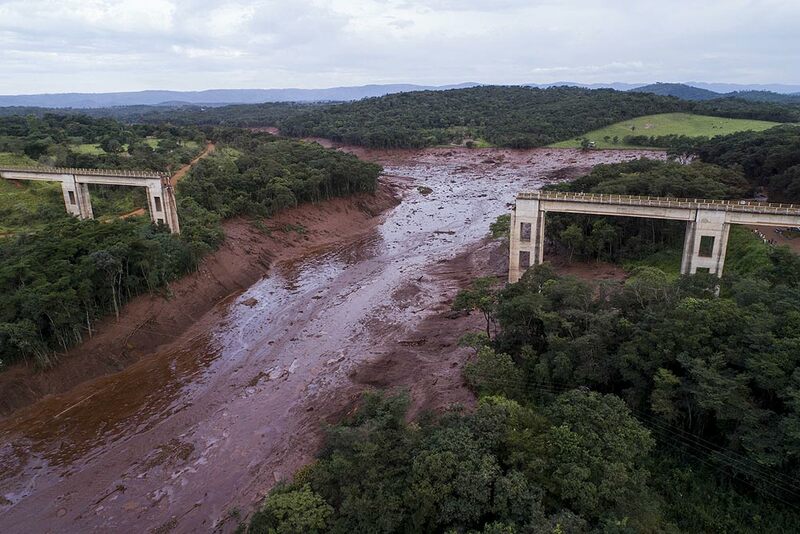 A structure lays in ruins after a dam collapsed near Brumadinho, Brazil. 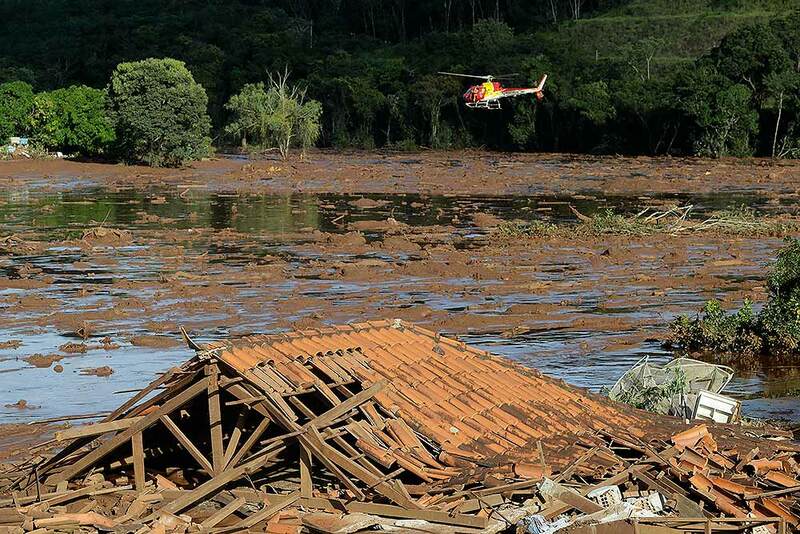 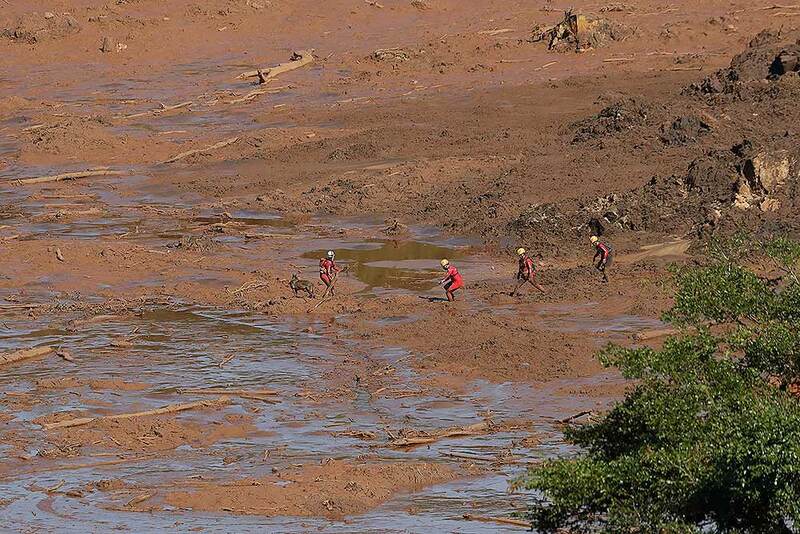 Brazilian mining company Vale SA said it didn’t yet have information on deaths or injuries at the dam but said that tailings have reached the community of Vila Ferteco. 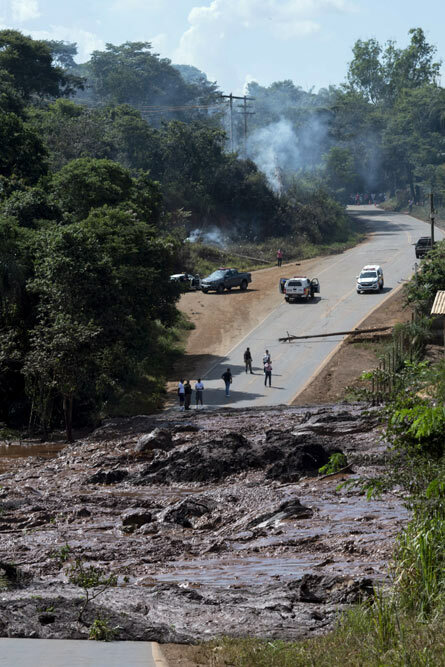 A road is blocked after a dam collapsed near Brumadinho, Brazil. 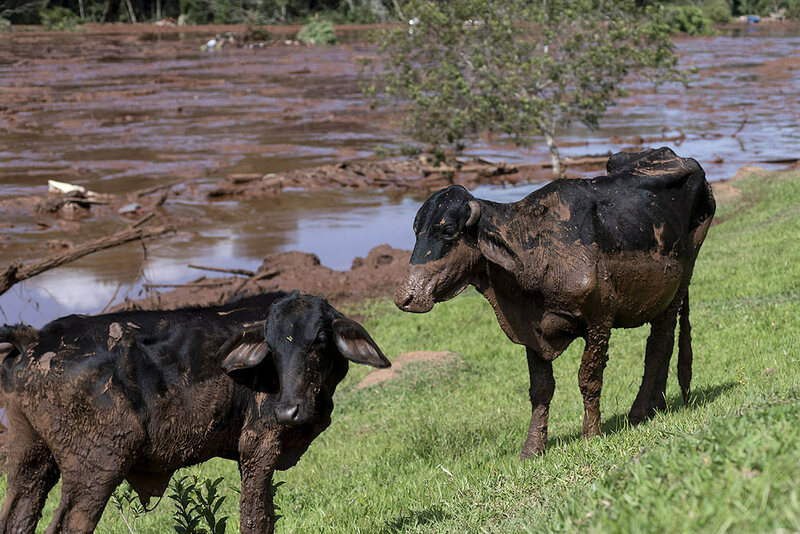 Cattle are covered by mining debris after a mine collapsed near Brumadinho, Brazil.